In a similar vein, scientists are working to create twisting helical electromagnetic waves whose curvature allows more accurate imaging of the magnetic properties of different materials at the atomic level and could possibly lead to the development of future devices. When scientists use electron beams to look at samples of materials, they have the ability to modify many different aspects of the electromagnetic waves that make up the beam. They can make the amplitude of the waves bigger or smaller, or make the waves faster or slower. However, until now there has been no easy way to transform a plane wave -- like the long rolling waves out at sea -- into a helical wave, like the ones that crash on shore. In a new study from the U.S. Department of Energy's (DOE) Argonne National Laboratory, scientists have created small regions of magnetic defects made from nanoscale magnetic islands assembled into a grid. The plane waves interact with these defects, thereby generating helical waves. "We're looking for waves with a kind of perfect curl, and in order to generate the curl we need to give them something to crash into, which in our case are magnetic monopoles," said Argonne materials scientist Charudatta (C.D.) Phatak. 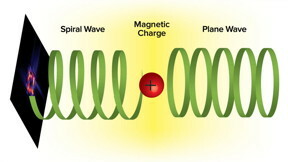 The reason scientists are so interested in helical waves is that they have a property called orbital angular momentum. Knowing the orbital angular momentum of an electron beam allows scientists to investigate the magnetic behavior of materials at an atomic level by determining an atomic property called the magnetic moment. "If we can see the magnetic moments of the material, we can build a description of the total magnetic properties of the material, and how the material will manifest its electronic and magnetic properties," Phatak said. In this way, the refigured electron beam could be useful for studying materials in which spin and magnetization play a crucial role, potentially paving the way towards new forms of electronic devices. Having access to the information encoded by orbital angular momentum will also allow scientists to better understand the nuances of chiral materials, which have a kind of left- or right-handedness that determines their properties. The grid of defects can be inserted into any transmission electron microscope to provide a direct way of imaging the sample. "People usually don't think about modifying the beam profile itself in this way," Phatak said. In the next phase of the experiment, Phatak explained that the researchers may seek to replace the grids of magnetic islands with solenoids, or coils of wire that can act as electromagnets. Using solenoids would allow the creation of more precisely tuned magnetic defects. "Right now, because of the arrangement of the magnetic grid, we can only create defects with a cumulative magnetization of two or four, but solenoids would allow us to have a much broader range of magnetization states," Phatak said. The work was funded by the DOE's Office of Science. The researchers also made use of Argonne's Center for Nanoscale Materials, a DOE Office of Science User Facility, to fabricate the magnetic islands through the use of electron beam lithography. The Center for Nanoscale Materials is one of the five DOE Nanoscale Science Research Centers, premier national user facilities for interdisciplinary research at the nanoscale supported by the DOE Office of Science. Together the NSRCs comprise a suite of complementary facilities that provide researchers with state-of-the-art capabilities to fabricate, process, characterize and model nanoscale materials, and constitute the largest infrastructure investment of the National Nanotechnology Initiative. The NSRCs are located at DOE's Argonne, Brookhaven, Lawrence Berkeley, Oak Ridge, Sandia and Los Alamos National Laboratories. For more information about the DOE NSRCs, please visit https://science.energy.gov/bes/suf/user-facilities/nanoscale-science-research-centers/ . A paper based on the study, "Direct evidence of topological defects in electron waves due to nanoscale localized magnetic charge," appeared in the October 22 online issue of Nano Letters. Argonne senior materials scientist Amanda Petford-Long also contributed to the study.